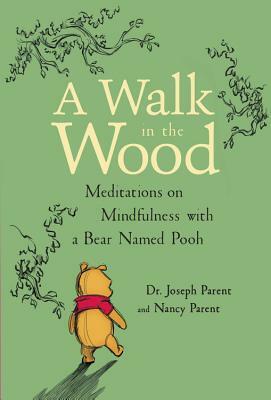 A Walk in the Wood: Meditations on Mindfulness with a Bear Named Pooh offers life lessons grounded in the simple act of slowing down, observing what is around us, and being present in our lives moment by moment. The benefits of mindfulness are well recognized: greater peace of mind, less stress, and the opportunity to work through and transform thoughts, memories, and worries. It also fosters equanimity, helping us accept the changes and challenges life brings. In our frantic world, who better to guide readers through this transformative practice than a long-beloved bear who has perfected the art of simply being? "Just two things to do to truly be Pooh-just be present and kind," he says. And, not coincidentally, he lives in the woods. There is a growing acknowledgment of the benefits of deeply experiencing nature. The calming quality of sounds like running water and rustling leaves, the soothing properties of smells like lavender and chamomile, and the emotional comfort of beautiful natural vistas are well known. A Walk in the Wood is both inspiring and instructive. Simple stories with clearly stated goals and easy-to-follow exercises provide all the tools you'll need to take the first step, or continue on your journey, toward a quieter and calmer way of living. Discover along with Pooh that mindfully exploring and experiencing the simple joys of nature is an ideal path for working on your own habits, attitudes, and emotions, while cultivating more meaningful relationships with others. Dr. Joseph Parent is a highly regarded expert in performance psychology working with athletes, actors, artists, and executives. He received his undergraduate degree from Cornell University and his Ph.D. from the University of Colorado. He has studied, practiced, and taught Mindful Awareness since the 1970s in the lineage of the great Tibetan meditation master Venerable Chögyam Trungpa, along with his friend and fellow author, Pema Chödrön. Dr. Parent is the best-selling author of ZEN TENNIS: Playing in the Zone, and ZEN GOLF: Mastering the Mental Game, with more than a half-million copies in print, digital, and audio formats worldwide. He is a sought-after keynote speaker at a wide variety of businesses and associations events. He offers executive coaching, Mindful Awareness training, and sports psychology lessons by phone or video calls anywhere in the world. Dr. Parent teaches in person at the beautiful Ojai Valley Inn and Spa resort in Ojai, California, where he makes his home.